I used this gorgeous Scenic Route Sonoma dp and added some paper piercing using an Embossing Queen brass template. The leaf stamp is from SU Embrace Life, and the sentiment is from SU Best Yet. The pearls are from Kaiser. Thank you so much for stopping by! That FLOWER IS AWESOME!! I'll have to check out the deets on how to do that. Love this card - so upscale/chic looking! Wow! What a fabulous card! 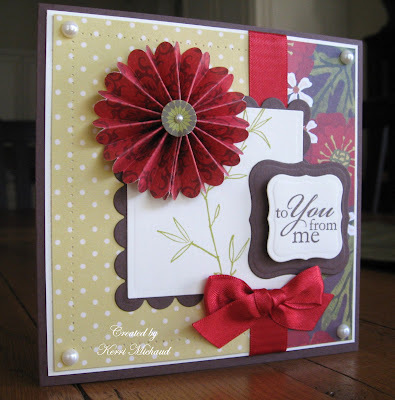 I love that flower, the designer paper, colors ... just an overall GREAT design! This just lovely and vibrant too! I love what you did with the whole card. Wow~!